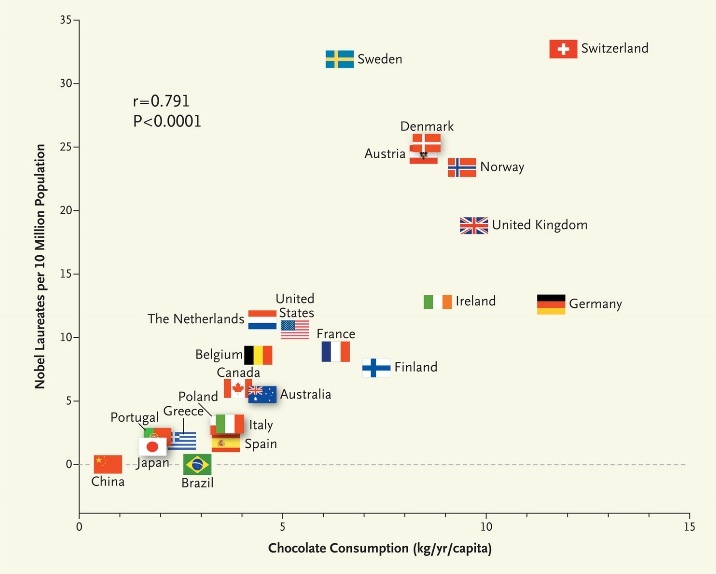 Graph: In which chocolate consumption strongly correlates with likelihood of getting a Nobel Prize. “Dietary flavonoids, abundant in plant-based foods, have been shown to improve cognitive function. Specifically, a reduction in the risk of dementia, enhanced performance on some cognitive tests, and improved cognitive function in elderly patients with mild impairment have been associated with a regular intake of flavonoids. A subclass of flavonoids called flavanols, which are widely present in cocoa, green tea, red wine, and some fruits, seems to be effective in slowing down or even reversing the reductions in cognitive performance that occur with aging. Dietary flavanols have also been shown to improve endothelial function and to lower blood pressure by causing vasodilation in the peripheral vasculature and in the brain. Improved cognitive performance with the administration of a cocoa polyphenolic extract has even been reported in aged Wistar–Unilever rats. By Franz H. Messerli, M.D. from Chocolate Consumption, Cognitive Function, and Nobel Laureates (October 10, 2012DOI: 10.1056/NEJMon1211064), via New England Journal of Medicine.